In a review essay yesterday headlined Modernist Master’s Deceptively Simple World, New York Times architecture critic Nicolai Ouroussoff champions the little-known Portuguese architect Álvaro Siza, who rarely builds outside Europe and thus has no chance of becoming a globetrotting figure like starchitects Frank Gehry or Rem Koolhaas. 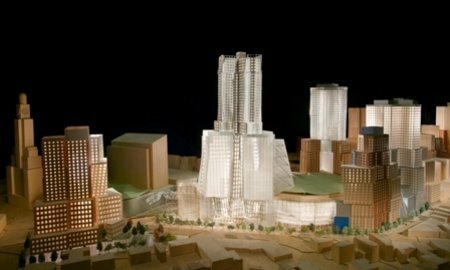 While Ouroussoff generally likes Gehry's work, he's expressed qualms about the Atlantic Yards project (right). And his essay on Siza might be seen as an implicit rebuke to city-making projects like AY. Whatever his doubts, his vision of an architecture rooted in a historical continuum seems vitally important in a world fractured by political conflict and ethnic hatreds. If an earlier generation of Modernists believed that architecture could play a vital role in spurring us along the road to utopia, we now know that progress is no longer a guarantee. Almost any society, it turns out, can quickly and unexpectedly descend into darkness and savagery. At the same time the march of global capitalism has made faith in technology, a Modernist dogma, seem less and less attractive. And if the bold and delirious forms churned out by celebrated architects today mirror social upheavals, they can also serve to camouflage the damage. The Atlantic Yards design may not mirror social upheaval, but it wouldn't be rooted in a historical continuum, despite plans to use brick and other locally-evocative materials for some portion of Gehry's skyscrapers.